Oculus splits into mobile and PC VR groups. Image: eVRydayVR via Flickr. Click for original. Facebook has decided to shuffle its Oculus division by splitting it into two groups, one that is focused on virtual reality for mobile and the other on PC VR solutions. Oculus CEO Brendan Iribe is stepping down from his role to lead the PC side. "As we've grown, I really missed the deep, day-to-day involvement in building a brand new product on the leading edge of technology," Iribe wrote in a blog post announcing the changes. "You do your best work when you love what you're working on." 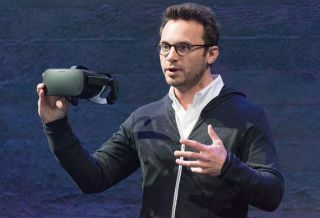 With Iribe stepping down, there's now a vacancy at the top of Oculus overseeing both the mobile and PC groups that he, former Microsoft technologist Jon Thomason (who recently joined Oculus and will lead the mobile VR side), and Facebook CTO Mike Schroepfer will look to fill. No candidates have yet been mentioned. This could be a pivotal moment in VR for the PC. While VR has been around in some form or another for decades, it was the Oculus Rift that really set in motion VR as a viable consumer experience. Iribe played a big part in that when he and Palmer Luckey started a successful Kickstarter campaign for the Rift in 2012. In 2014, Iribe was brought on as CEO after Facebook acquired Oculus for $2 billion. "VR went from science fiction to the most exciting new consumer technology around. Oculus has gone from shipping early dev kits to introducing virtual reality to millions of people with Gear VR to launching the immersive power of Rift. Just last week, we put your hands into the experience with Touch," Iribe said. "I couldn’t be more proud of what we’ve created—not just the products but the culture and team." It hasn't always been smooth sailing for the Rift. When the $599 headset finally released to the public as a finalized product (not a dev kit), Oculus had trouble supplying enough units to meet demand. Many people who pre-ordered a Rift were left waiting longer than expected after launch. That gave HTC and its Vive headset a chance to build some momentum, especially since it shipped with motion controllers from the beginning, though the Vive got off to a rocky start as well. Even so, we're at the very early stages of VR. With Oculus splitting into two groups, it might be better positioned to serve mobile and PC with less hiccups.